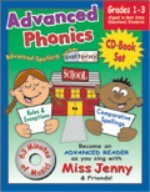 25 original songs that address the more difficult concepts in learning to read. Complete with full-size, 62-page book of lyrics and classroom-tested teaching ideas. Ed Says, "Ed, d, t."
28 original songs that teach letter sounds and how they build words. Complete with full-size, 60-page book of lyrics and excellent teaching ideas.